Holy water, or water blessed through recitation of holy prayers, is a common aspect of ritual worship in all major religious traditions in the world, and indeed, it has been used in numerous socio-religious cultures from the past right up to the present. In the Islamic world, for example, holy water is used to cleanse certain parts of the body (face, both hands including the elbows, both feet up to the ankles) in preparation for the ritual prayers (ṣalāt). Thus, (partial) ablution, or wuḍū', is an obligatory procedure for Muslims so that they can perform the formal prayers in a state of ceremonial purity. 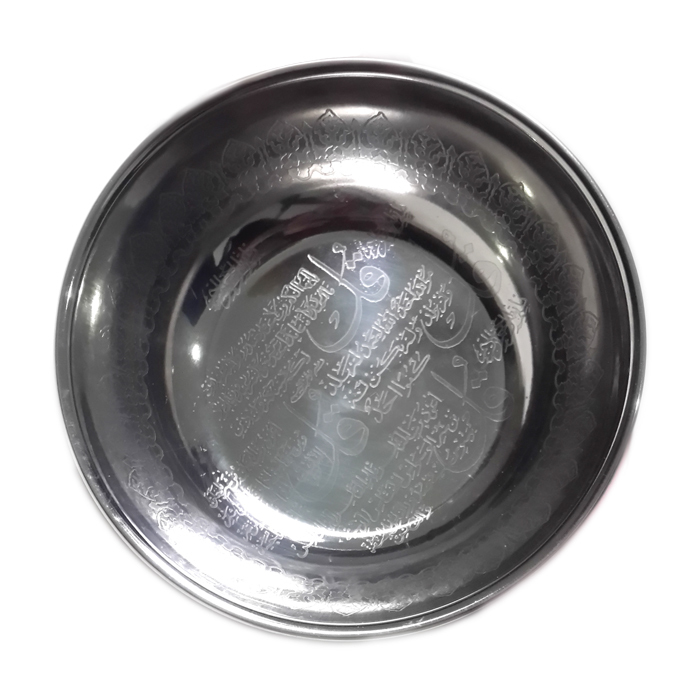 The holy prayer water bowl, then, can be used for the ritual washing parts of the body. 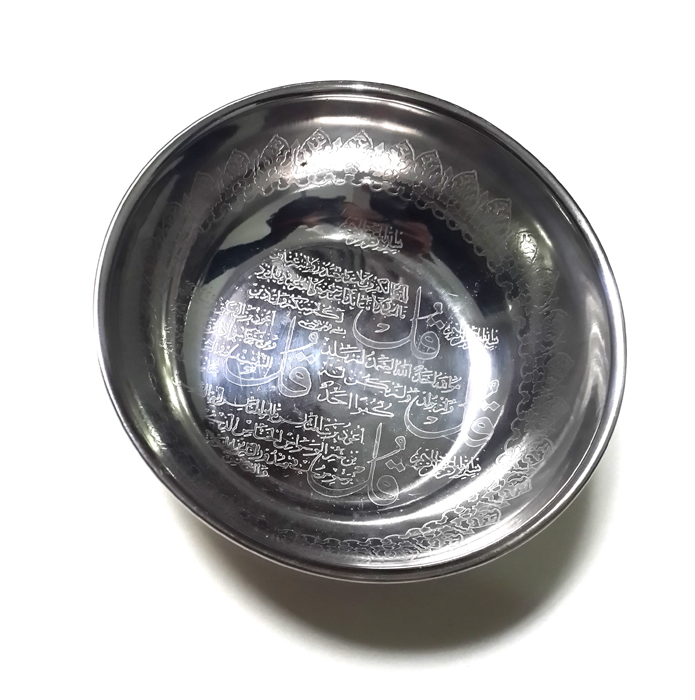 Beside the procedure before commencing the formal prayers, the water bowl can also be used for another profound act of worship, namely supplication (dū'a'). The invocation of dū'a' prayers requires mindfulness and unwavering concentration. When one thus recites holy prayers, and makes sure that s/he chants the sacred words with sincere intentions, then, ultimately, the power of prayer can be directly transmitted onto the water in the bowl. Hence, the prayer water will be imbued with magical blessings. 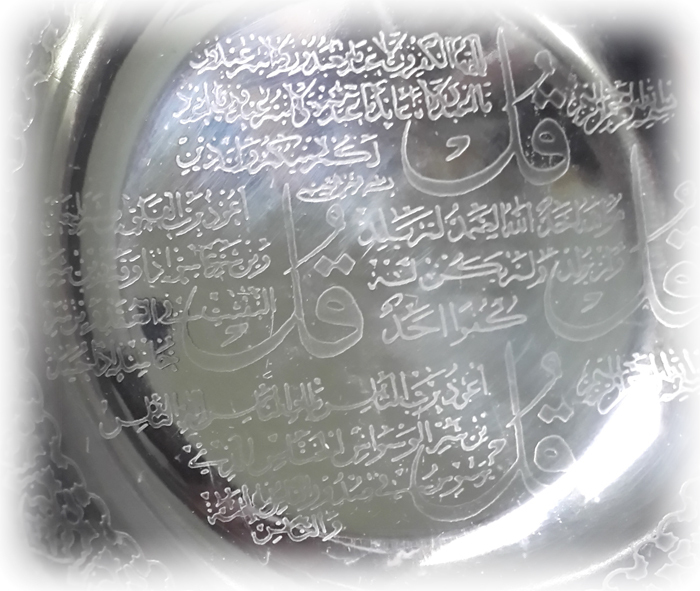 Yet in order to increase the magical power of the blessings and the mystical properties of the prayer water, there are Islamic spells engraved in sacred Arabic lettering on the surface of the bowl. These spells serve to induce the divine characteristics of the Islamic wali saints, which bring protection against black magic and evil jinns, and bestow blessings of good luck, improved fate as well as an increase in fortune. In this way, when water is poured in to the bowl, whether the water has already been blessed or not, it will automatically turn into holy water due to the power of the Islamic spells. In order to do this, the bowl should be filled with distilled water and left standing for one night, preferably outside one's residence, to absorb the bright light from the moon and the stars. The next morning one will have a bowl of holy water which is ready for immediate use; i.e. to use it before performing the morning prayer.